Same brand, Same Price Point, Pretty Much The Same Promises but Two Completely Different Textures? So my first MUFE HD Foundation was the Liquid consistency. I picked this up from the Make Up Forever Debenham's stand on Oxford Street and after hearing such great reviews for this foundation I was more than excited to take it home with me. (I've done a full review of this foundation here .. So check it out for all the in's and outs). For a bit of a summary I had a good few weeks of January where this was the ONLY foundation I was reaching for. It's completely build-able and can range from medium to full coverage really easily. Like I mentioned in my previous post the colour match of this foundation is amazing for me and it gives me a very natural finish with the illusion of flawless skin! 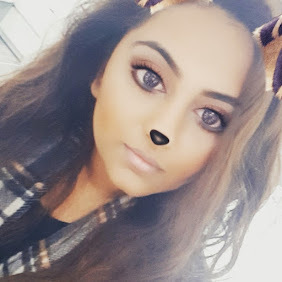 So whilst I was so happy with the Liquid foundation all my fellow beauty lovers around me were telling me the Stick foundation is the way to go. After all the ranting and raving (and just so happening to be in Oxford Street) I picked the stick formula one up too. Similarly to the Liquid foundation, there is such a great colour range for this foundation and within minutes I had found the perfect shade for myself but the salesman at the stand was insisting he tried it on my face with the MUFE setting powder on top. (Can I just say I was so impressed with myself being able to colour match myself just by looking at the product in the bottle - Go me!) As soon as he tried the product on my skin I was sold. Instantly the finish was looking natural yet high coverage and added a beautiful healthy dewy glow. This is obviously the main difference between the two foundation types. The Liquid Foundation is a great consistency and not as runny as many other high end liquid foundations I own. It's very easy to blend using a damp beauty blender or a Kabuki brush spritz with a little MAC Fix+. Now onto the Stick Foundation, as you can imagine the product goes on a lot thicker and takes a little more blending to get the perfect finish. I personally love this kind of texture in a foundation (As you can tell from my previous post on the Supercover foundation). I know the conventional way to apply this product is just drawing random lines across your face and blending but I found I got the best finish when I used a foundation brush to take some product and applying it that way. This is a lot more time consuming but the great sales assistant at the MUFE counter told me as well as being the most hygienic way to prevent breakouts it was also the best way to be maximum coverage. Overall, the MUFE Stick Foundation wins the Texture award for me! Now this is a tough one to call. 1. Because they are pretty similar and 2. Because it really does depend on the look you are going for. Starting with the MUFE Stick foundation I would describe the finish as high coverage and perfect for photography. This foundation will erase every single imperfection or blemish on your face. So giving a flawless, airbrushed finish this has been my go to foundation when I really want to make an impact. As for the Liquid version, again it is very high coverage and a great foundation to even out your skin tone. This version provides me with a more natural and dewy look but whilst using this foundation I can notice my dreaded Oily T-Zone pop it's head around the corner after a couple hours of wear. Again, Winner is the MUFE Stick Foundation! This I can keep short and simple. They are both such a great colour match and the colour selection is absolutely fantastic for all the Make Up Forever foundations. The stick version has a slightly pinker undertone however both blend out perfectly. While these are both completely different to suit their different needs I honestly prefer the size and packaging of the stick foundation. Perfect for those of you who travel a lot as it is aeroplane friendly and can easily be carried around in your make up bag. The glass bottle of the Liquid foundation adds a bit of a luxaurious touch to the foundation and the pump is such a great added feature. All in all, packaging can't really be compared as both are sleek, stylish and very suitable. Both come with a price point of £29 and to me this is perfectly reasonable. Whilst I'd love them to be slightly cheaper and on the lower end of £20-£25 you do get a high end product for a high end price. Overall, if I was to go back and only pick up one of these foundation I think it would be the Make Up Forever Ultra HD STICK Foundation as it is something different to the majority of the foundations in my collection and gives an amazing high coverage, flawless finish which will come in handy for all the big events coming up in the year. 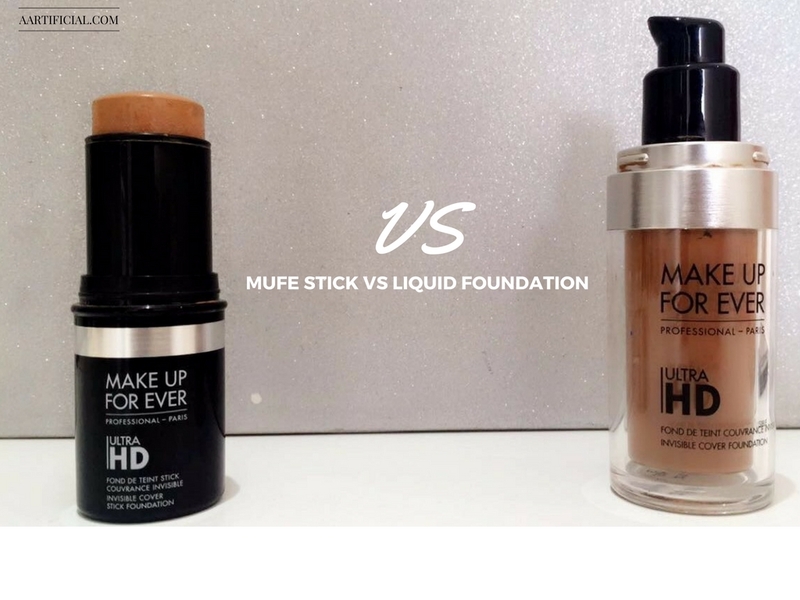 The only similar foundation I have ever used is the Supercover Professional Make Up Foundation which still is my absolute favourite and cut above any other high end foundation - but this is about MUFE so I'll save my ranting and raving about that for another time. I hope you enjoyed this post and it helped you highlight some of the differences between the two foundation forms! Have you tried either or both? What are you opinions? Let's not make this all about me and let me know below..